RSS news reader, tickertape style. Is there a better alternative to Tickershock? Is Tickershock really the best app in Newsreaders category? Will Tickershock work good on macOS 10.13.4? Tickershock... 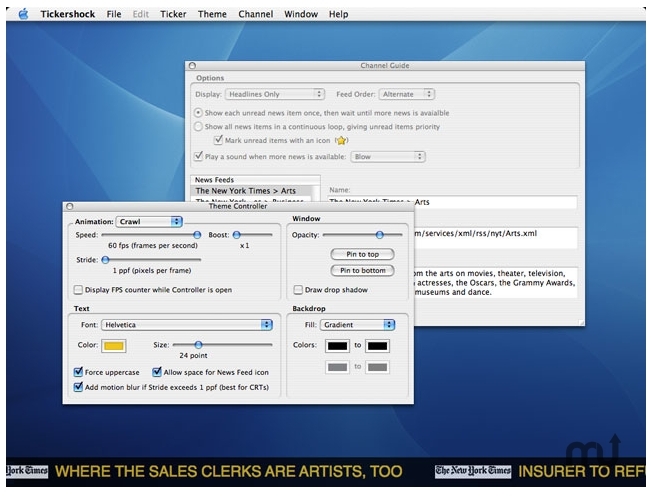 Inspired by the tickers of 24-hour cable news, Tickershock is an RSS and Atom news reader that displays news feeds anywhere on your screen in a animated crawl or billboard display. Tickershock is a departure from typical RSS applications that emulate traditional Web browser or email reader environments. Focusing on the "push" nature of the technology, Tickershock aims to be a passive experience - but only until you decide a headline is worth exploring: a double-click on a news headline brings up a "News Inspector" (or your default browser) from which you can explore a story in greater depth. New feature development on Tickershock has been discontinued and as a result, the product is now freeware. Added new icon and Spaces support for Leopard. Improved HTML entity parsing in ticker titles. Fixed scrollbar update issues in News Inspector. Tickershock needs a rating. Be the first to rate this app and get the discussion started! And since it's optimized for performance, Tickershock requires a fraction of the CPU time used by more conventional stock and news tickers, freeing you to work but keep an eye on the news all the time.